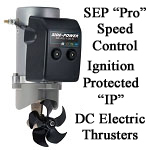 SidePower's "Pro" series of boat thruster systems allow complete control of your thrust drive without the need to "feather" your thruster on or off. Control exactly where your vessel goes with a touch of propulsion or a heady blast to stave off headwinds. Ignition Protected and Standard casing options for the Speed Control "Pro" Series of SidePower's bow and stern tunnel thrusters. Ignition Protected or "IP" bow and stern thrusters have a hermetically sealed compartment and are typically used on gasoline powered vessels. Speed control IP thrusters are available with "push" strength up to 170kg. There is no open spark or electrical wiring with Ignition Protected thrusters. Standard model bow and stern thrusters are unsealed units that are usually used on diesel powered vessels because the fumes do not ignite with a spark. Standard speed control thrusters are available with a "push" strength up to 240kg. 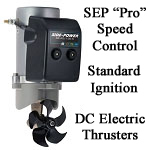 With a SidePower "Pro" marine thruster unit you can make your leeward the windward . . . That's the power of propulsion. Water-sensitive components are hermetically sealed in case.